Dr. Samuel Ting announced that the Alpha Magnetic Spectrometer (AMS-02) on the International Space station has recorded 25 billion events over a year and a half. 400,000 of those events were high speed positrons (e+). The PAMELA instrument on the Recurs-DK1 satellite also found that cosmic rays have more high speed positrons (e+) than slower ones. The AMS-02 instrument has two rings of neodium-iron-boron permanent magnets arranged to deflect charged “particles.” Instruments above and below the magnets detect things entering and leaving, time their passage and calculate their deflection. The data shows the ratio of positrons (e+) to electrons (e-) increases with the speed of the events. The instruments found that faster “particles” are more likely to be antimatter particles, (e+) rather than (e-). However, the ratio’s increase begins to slow with the highest speed particles they detected. Dr. Ting reported that the instruments did not vary their detections appreciably with direction or time. Where do cosmic rays come from? Charged particles are deflected by the galactic and local magnetic fields. The longer their flight path through magnetic fields, the more they are deflected, which makes it difficult to trace the source. (1) Gamma ray bursts (energetic photons) could produce cosmic rays by collisions with neighborhood atoms, however, there is no evident correlation between GRBs and cosmic rays. (2) Some energetic protons have been traced back to super-nova remnants within the Milky Way. (3) Super energetic cosmic rays in the southern hemisphere have a greater density in the general direction of the radio galaxy Centaurus A. Quasars and active galactic nuclei may be partly responsible for cosmic rays. (4) Energetic stars and micro quasars within our galaxy could be spewing out particles. (5) Dr. Ting mentioned the possibility that positrons could originate from dark matter collisions. Dark matter is an appropriate name, since it is invisible in any part of the spectrum. It seems to act just like a perfect vacuum, since it allows light to pass without affecting it. If it is undetectable with any instrument, why do scientists imagine that it exists? Cosmologists cannot figure out how galaxy clusters fit their maps of the universe. Some of them have drawn huge globs, like continents, of invisible matter to force their mathematical models fit a big bang. Astronomers try to understand star dynamics in galaxies. They cannot find a way to make their laws of gravity work in galaxies without putting massive amounts of invisible “gravity only” matter in a torus around every galaxy. The invisible matter, they claim, has more gravity than the visible galaxy. In some case, such as galaxy clusters, they need 20 times as much invisible matter as the natural kind to try to force their theories on enormously active clusters. Particle physicists try to understand the sea of particles with symmetry. They find unsymmetrical things like too many e+ positrons. They also find a convenient use for invisible matter. Perhaps we are swimming in a sea of invisible matter that causes their unsymmetrical observations. A century ago, invisible ether was an essential part of physics. Aether was the stuff breathed by the gods in Greek mythology. Ether, also turned out to be a myth. Is dark matter also mythical? It is easy to make up ad hoc stories about undetectable things. 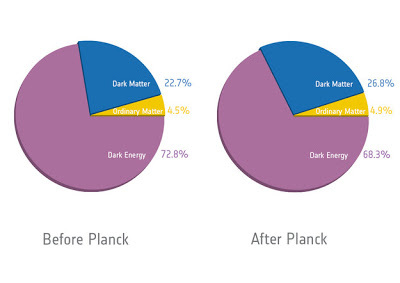 According to scientific estimates from the Planck telescope, the universe is 26.8% dark matte. What does this mean? They estimate that it is 68.3% dark energy. This leaves only 4.9% of our universe as ordinary matter, the kind that we experience, the kind that interacts with light. This is not a minor fudge factor. Scientists are suggesting that 84+% of all matter in the universe is invisible. You cannot prove the emperor’s robes don’t exist. After all, you just defined it as invisible, woven out of invisible threads. Only scientists are qualified to see invisible things. They alone can detect the emperor’s mathematical, invisible robe. This lad says, the emperor is stark naked. How did the smartest people come to believe ad hoc stores about invisible things? The Greeks were the first to try to invent science, but they struggled with the world view of their era. In that day, people believed that everything changes. If matter is changing itself, the Greeks realized, science is impossible. A thousand years later, medieval scholastics, when they adapted Aristotle to fit their concept of an immutable God, invented the idea that the essence of substance, what it intrinsically is, does not change. Everything can and does change except the essence of substance. Westerners inherited their ASSUMPTION that matter’s intrinsic nature does not change from the medieval Catholics. It was upon that ASSUMPTION that generations of scientists defined their empirical definitions, mathematical methods and measuring system. Invisible matter and invisible vacuum energies are necessary to force the universe to fit the basic assumption of all scientists that matter is not changing relationally. 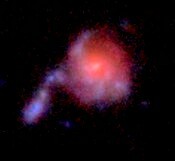 We often see blue globs in equally spaced strings surrounding the redder core of many early galaxies. At many ranges, we observe that galaxies grew as those globs spread out, the stars coming out from formless matter at the heart of every galaxy. At many ranges, we observe how the space matter takes up increases as its light clock frequencies increase and star streams accelerated outward. Billions of galaxies grew into huge, local, growth spirals. What is visible shows matter changing itself relationally. Look at the pictures of early galaxies and you will see reality without the need for invisible things. The visible history of the universe demonstrates that the fundamental faith of all scientists is false. You do not need to imagine undetectable things like space time or invisible matter. All you have to do is believe the light from long ago. This is from NASA’s Hubble Ultra Deep Field – galaxy 4491 with its long string of blue star globs emerging from a redder core. The pie chart shows how scientific estimates of the amount of invisible things changed due to calculations made with the Planck telescope. The picture is courtesy of ESA and uses mathematical estimates based on the notion that ancient atoms clocked the same frequencies as modern atoms.